The Carpetbag Theatre is Celebrating 50 Years in Knoxville this Year! The Carpetbag Theatre, Inc. was founded by Wilmer F. Lucas, a writer and actor from New York City, and Cleopatra Lucas, an artist and professor at Knoxville College and the University of Tennessee in 1969, after a meeting with community artist, activists, and organizers. The Carpetbag Theatre, Inc. was started during the height of the black arts movement, a cultural movement that joined radical politics with black art and cultural practices. It was created to give voice to the black community and move them to action. Linda Parris-Bailey came to Knoxville and began her work with The Carpetbag Theatre in 1974 as a recent graduate of Howard University with a degree in theatre directing. 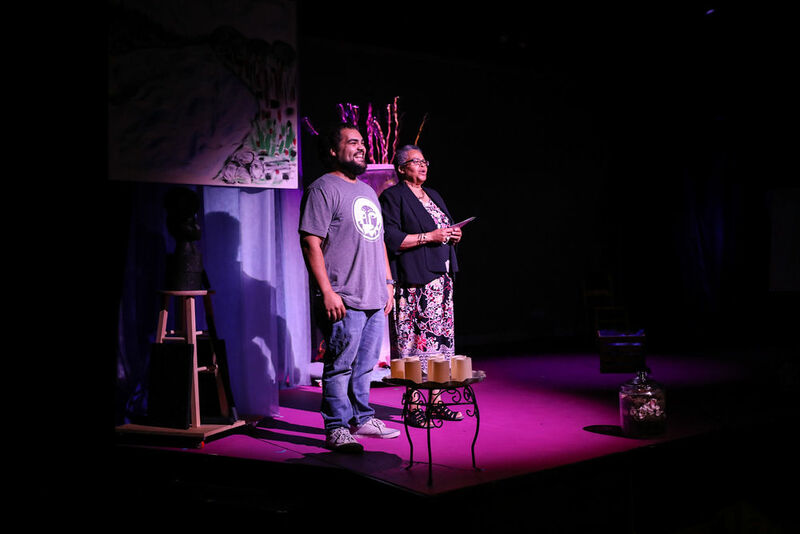 When she met Wilmer, who was already focused on creating original work, she shared with him her dream of an ensemble theatre company that produced original touring theatre productions. Wilmer agreed and this was the beginning of the ensemble years under her leadership as primary playwright and executive/artistic director. The artistic vision of the organization is rooted in the practice of revealing, reframing, and reclaiming the hidden stories of our communities. By listening deeply to the stories of different communities, the beauty of our collective experience is revealed and creates the space for us to embrace the hardest parts of our stories - all while leaning into the freedom of healing - in spite of them. Through this process, experts and doctors have come to believe that this helps us to reframe our experiences and release communities from the strongholds that hold us hostage over time. This process is what has given The Carpetbag Theatre the material from which they have created their original theatre productions that have toured nationally and internationally. Quite impressively, it’s also resulted in a Broadway run of their most beloved show, Dark Cowgirls and Prairie Queens, at the New Victory Theater in New York City! Who knew for a small arts organization based right here in Knoxville, Tennessee, right? In celebration of 50 years of revealing, reframing, and reclaiming the hidden stories of our communities, The Carpetbag Theatre has been producing the 50th Anniversary Celebration Series! This performance series brings Knoxville the signature works of Carpetbag that haven’t been seen in over 20 years - all in 2019! The next play in this series is Swopera: A Spoken Word Opera that will be performed April 11-14 at the Ula Love Doughty Carousel Theater on University of Tennessee’s campus in Knoxville. Swopera tells the contemporary story of gentrification, one family’s efforts to save their business, Lowell’s Soulfood Café, in light of the changing community dynamics, and finding unexpected leadership in the youngest member of the family, Lem. This text is delivered through spoken word poetry and rhyme, accompanied by musical elements of hip hop and soul. The production was conceived by Linda Parris-Bailey and written by Linda Parris-Bailey, Stephen L. Heathcock, Joseph Woods Zakiah Modeste, Omar Abdel-Aleem, Carlton "Starr" Releford, and Ajeet Khalsa. Swopera is directed by Steven Sapp and Mildred Ruiz-Sapp of Universes and is fully supported by the Roy Cockrum Foundation. Tickets can be purchased online at www.carpetbagtheatre.org. The Carpetbag Theatre, Inc. is a Knoxville-based professional, multi-generational ensemble company dedicated to the production of new works. We work in partnership with community artists, activists, cultural workers, storytellers, and leaders to create original, theatrical works. Our mission is to give artistic voice to the issues and dreams of people who have been silenced by racism, classism, sexism, ageism, homophobia and other forms of oppression. You can keep up with their performances and happenings at www.carpetbagtheatre.org and also follow along on Facebook, Twitter, and Instagram.